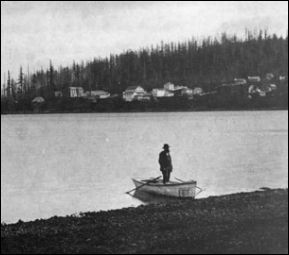 Dan Harris alone in his canoe, with the old town of Bellingham/Unionville behind him on the flank of Sehome Hill in this Galen Biery photo. Most of the photos on this page can be seen in the Collector's Edition of Biery's book, Looking Back, or at the Whatcom Museum of History and Art; that website link will direct you to information about how you can see the entire collection by appointment and purchase copies. Frank Teck,The Evening Herald, Fairhaven, April 11, 1903 If everything that is told of Daniel J. Harris, the original Fairhaven man, were put in type, it would make a very big and a very breezy book. For of all pioneers, Dan was always alleged to be doing things, having things done to him or being prominently on hand when notable things were happening. Dan was a rover whom even so eruptive a string of episodes as the Indian war of 1855-6 could not jar into retirement. Even during the most hair-bristling periods of that historic difficulty, Dan, according to his old friend, James H. Taylor, traveled all over the sound in his study sloop and sold the real old John Barleycorn at $1 per pint to anybody of any color who gave the grand hailing sign and allowed of the annexation of the price. The Indians from Puyallup to Nootka Sound knew Dan Harris and molested him not. Dan Harris Indian Legends Local ways apparently added much to the romantic character of the storied Dan, supplying to him every unusual tale in which the hero's identity was not quite unquestioned. Some day, when wealth and the luxury of leisure overtake the present historian, maybe a series of these irregular but irresistible yarns will spin themselves out in real [manuscript]. Although many of these stories are too fanciful to be taken without salt, and it is easily proved even at this late day that some are applied to Dan on account of the exploits of other pioneer heroes. Once upon a time, so the story goes, Dan and his sloop were captured by Fraser river, B.C., Indians, off Point Roberts and he was, with two companions held in slavery for a long time. Finally the captain of a British schooner happened to learn of the three unfortunates and undertook to rescue them. The chief parleyed with the sailor and the result was that the three captives were ranged in single file and bought, one after another, by the white Tyee. When the first man was put up, the Siwash chief said he was worth five blankets. The five blankets were counted and handed over to the chief's attendants. The second man was a particularly apt fellow and the chief demanded seven blankets for him, and got them. Next, the celebrated Dan Harris stood up for appraisement. "How much for him?" demanded the master of the schooner. The old Indian looked at Dan with evident displeasure. "Ugh!" he grunted, him delate Skookum! You takem — no blanket. Heap eat, no work!" Another Indian story about this rather ubiquitous pioneer is that one time, about 1858 or '9, while Harris was returning from Victoria with the usual rice, etc. he was overtaken and surprised by a party of Semiahmoos who tapped his barrel, became hilarious, stripped off Dan's clothing and set him adrift. Next time Dan went to Victoria, he fixed up things for fun on his side of the game. He "doctored" a barrel of booze and went fishing for Semiahmoos off Point Roberts. The Semiahmoos bit hard, and it is legendarily told that a whole mob of Semiahmoo fighting men had no more fight than a rabbit in them after Dan fired the second barrel into them. Some tell this story with accompaniments of flocks of fatalities, and that raises mere doubts and eyebrows. It was Dan Harris, who, in 1859, conveyed the news of the Nooksack Indians' exploit at the old brick house in Whatcom, to Major [Granville O.] Haller at Fort Townsend, and the unexpected suddenness of Major Haller's arrival upon the scene of hostilities was no small compliment to Sailor Harris and his speedy sloop. This photo from the 1891 Fairhaven Illustrated magazine shows a dandy in a suit, leaning on his walking stick while standing on the beach at Fairhaven and looking out over what Dan Harris originally called Harris Bay. Magazine from the Bourasaw collection. Harris Hits the Trail Another incident of Harris, like the real hero, being on deck in the nick of time, mentioned in the preceding article, was his effort to induce Captain Roeder's young Northern Indian to accompany him to the Cariboo country. A few hours later the young Indian was murdered at the Roeder homestead by Chief Telliskanim of the vengeful Nooksacks. During 1860, Harris hit the trail for the new gold diggings up in the Cariboo district, British Columbia, and during all that season worked as a packer of supplies on the trail. It is said that Dan could carry about as much as an ordinary burro would pack, but at this distance there is room for doubt on that statement. However, Dan was a powerful worker, and was a great success on the trail. In the summer of 1861 he had money enough piled up for a trip to San Francisco and from there into the Salt Lake country., where he bought 700 sheep and drove them to San Francisco for shipment to Whatcom. It was a very dry, hot summer and many of the sheep were stifled by the dust or died of the heat. Upon the trip north on a freight bark, poor accommodations and a water famine left the flock sadly diminished when they were landed at the old Bellingham coal wharf. Many of the poor animals were crazed by thirst and upon reaching shore they stampeded into the bay and filled themselves with salt water. Meanwhile, Dan and his help were making frantic efforts to secure the frenzied animals. Finally there were all driven to Marietta, where winter quarters were prepared for them. In the spring, Dan gathered up the remains of his flock of 700 sheep, a little sorry-looking bunch of twenty-two, and took then mover the tortuous trail into the Cariboo country where for at least two seasons thereafter, he enjoyed the princely distinction of operating a pack train with a retinue of half a dozen tough cayuses. Most of the wiveless pioneers of Harris's time succumbed to the charms of the native belles, but Harris, according to his intimate friend and Tillicum, James H. Taylor, was a little particular and somewhat divided in his pioneering love affairs. Taylor informs me that Harris went far to the north to find his Indian companion and then brought back two maidens of the Caldwell tribe. What became of them nobody now living seems to know, but it is probable they returned home in due time and lived happily ever afterward. Harris in Boom Days As previously recorded, Harris's donation claim was bounded on the west by what is now Seventh Street. In 1861, Harris bought from Americus N. Poe the forty-three acres west of that line, extending to the waterfront, including what was then known as Graveyard point, but which during the glamour of the boom of 1889 became famous as Dead Man's Point, so called as a mark of disrespect by zealous Whatcomites, who already recognized in what the Indians called Seeseeleechem, "a place of safety," the lusty embryo of a formidable rival. Dan paid Poe $53.75 for the $53.75 for the forty-three acre tract, which afterward became the principal part of his town. But he had to buy it all over again in 1870. It seems that, unknown to Alonzo M. Poe, his brother — Americus N. Poe, had in October 1858 included this tract in the sale of 310 acres to A.A. Denny of Seattle, the property having been signed over to Americus N. by the holder of the donation claim, Alonzo M. Poe, earlier in 1858. Harris and Denny, however, settled the matter in 1870, when Harris secured a quit claim deed from Denny for $53.75. On December 2, 1862, Harris imagined he sold Graveyard Point, four acres, to Whatcom county for $150, and, although he didn't, the imagination struck so tangibly that some forty odd corpses bore witness to its vitality as late as the spring of 1889, when the pioneer graveyard was abolished and the remains taken elsewhere for burial [Bayview, to the south]. For twenty-six years this county thought it owned Dead Man's Point and continued to bury its dead there. There, in 1888, it was discovered through the sale of the Harris estate to the Nelson Bennett syndicate, that Harris's deed to county was for four acres in lot 2, section 11, instead of in lot 1, section 2. I haven't taken the trouble to look it up, but I guess the county still owns what it didn't intend to buy. This drawing from the 1891 Fairhaven Illustrated shows what we believe to be Donovan Avenue, extending west to early Harris Bay in 1880s. It was possibly drawn by someone sitting on the huge Donovan Rock. See the photo of the Rock below. Fairhaven, on Harris Bay There was nothing slow about Dan Harris when he saw reports of immigration in 1882. That was when he conceived himself in the role of the boss of a town. On January 2, 1883, he filed in the county auditor's office the plat of "Fairhaven on Harris Bay." Afterwards he told E.M. Wilson [for Wilson, see the April 4, 1903, Teck article] the story of how he came to name his prospective town Fairhaven. "See-see-leechem, the original Indian name of the cove or bay from Dead Man's point to [old]-Bellingham, afterwards known as Harris Bay, means a "place of safety," where the Indians spent many happy hours in camp when the storm raged on the open [Puget] sound. Harris's interpretation of the Indian word was "a safe port" or "a fair haven." Harris's plat of Fairhaven, beginning on the north contained Douglas Avenue, Gambier, Knox, Columbia, Mill and Harris streets and McKenzie Avenue; beginning at the west, First to Fourteenth streets, inclusive. All streets were platted eighty feet wide and McKenzie Avenue one hundred feet wide. There were only two avenues, McKenzie and Douglas. The amended plat of 1889 adds Bennett Avenue in place of Fourth Street. All of which it is well to remember to this day in order to avoid confusion of streets and avenues. Harris took particular pride in his shipyard reserve, which consisted of two blocks, between Third and Fourth streets from McKenzie avenue to deep water. This was a particularly fine site for a shipyard, but was never utilized as such and the reservation does not appear in the amended plat. Those of us who lived in the Fairhaven area or around Western pre-1965 will likely remember the subject of this Galen Biery photo of Donovan Rock in the foreground and Donovan Avenue extending west to the Bay. The Big Rock was deposited during glacial movement in the last ice age, more than 10,000 years ago. The material is known as Jackass Mountain Conglomerate, coming from Jackass Mountain, 150 miles north, near Canadian border. 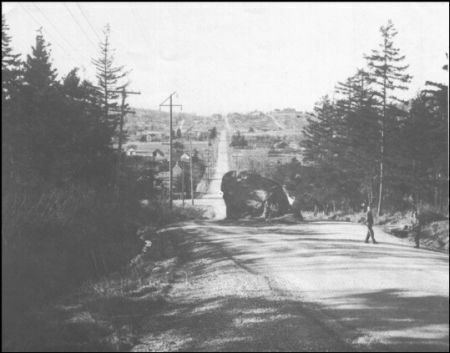 When Hwy I-5 was blasted through the hillside in 1965, the original rock was destroyed, broken into several pieces. Donovan now dead-ends at the freeway. Harris's Fairhaven Hotel During the early part of 1883, Harris built the Fairhaven Hotel, a three-story frame structure still standing on northeast corner of Harris Street and Bennett Avenue. The grand opening of this hostelry was a pyrotechnic function of the most elaborate order. But few things concerning the event were remembered by the participants. The hotel was luxuriously fitted up as to parlor, where was stationed, in the midst of gleaming marble-top furniture, perhaps the first piano brought to Bellingham Bay. Harris never made any money in the hotel business; in fact, he never conducted the hotel as a regular caravansary. But he took much pride in the establishment, as he did in everything else of his that looked to be worth while. The Biggest U.S. Flag Any one could have guessed from the naming of Fairhaven's streets that the original Fairhaven man was an ardent Democrat. During the campaign of 1884, Harris promised the boys a gay time should Grover Cleveland be elected, and he was. Harris then proceeded to prepare for festivities to be eventuated on the following March 4th, the date of the inauguration of the new president. He pledged his word to all inquirers that upon that auspicious occasion he would float in front of his hotel the biggest flag they ever saw — in fact the very biggest flag in the United States, if money could buy it. Meantime James H. Taylor, who was a ship carpenter, was engaged in the construction of the tallest flag pole ever raised in the United States. It was 125 feet long, built in two sections like the mast of a ship, the upper section being attached to the lower in such a way as to permit of its being lowered alongside the lower one like the blade of a jackknife. Thus it stands today in front of the old pioneer's hotel, in the middle of his shipyard reserve. Barring the famous flag pole at Mount Vernon, which, however, was a cedar tree, the body of which were trimmed by a nimble sailor. Harris's was always regarded as the tallest flag pole in the country. The Mount Vernon tree was burned a few years later. Taylor worked hard to have the great pole ready for the raising on the morning of March 4, 1895, (actually 1885) but during the last few days John De Fries was drafted into service to help get the sky-scraper ready. This series about Daniel J. Harris and the legends that surround him follows our goal of looking underneath the written record about Pacific Northwest pioneers. 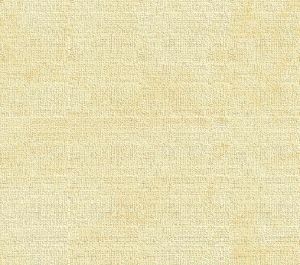 Instead of just transcribing first-source documents, we annotate them extensively, both to profile the individuals and businesses mentioned and to correct the record when we find authoritative sources that dispute the legends. We especially want to thank Donna Sand and Ralph W. Thacker of Bellingham, who share our goal of illuminating history, especially the material that has sometimes fallen through the cracks. We also thank Taimi Gorman, John Servais and other members of the Fairhaven Association, which was formed to assemble and communicate the history of the village that Harris founded in 1883. We also urge readers to attend Dirty Dan Days on April 28-29, 2007, in Fairhaven, and to look for Thacker's publications, which will supplement this present series. [The flag] A Way-Up Event Early on the morning of March 4, before sleepy Dan had tumbled out of bed, the Democrats from all over the county began to assemble at the festal ground. All told, as nearly as some of the best of them could remember, about forty-five or fifty men were present. The raising of the pole was a difficult problem, the first battling element of which was digging the hole for it in the shifting sand, to overcome the reverseness of which was too much for the clan. Finally a Republican named Delaney — who formerly resided at the corner of Thirteenth and Taylor and who sold his property in 1889 for $27,000 and bought a farm in Oregon, where he still resides — dug the hole and passed the next element of the problem up to the sailor men. Meanwhile the guests had found the inner attractions of the Harris manor, demijohns of brandy and wine galore were found in the storehouse and solemnly passed around, and then some more. Dan's idea of true hospitality ran all in liquid channels. There was oceans of stuff to drink but not a bite of anything to eat. So all day long what was lacking in solids was filled in with liquids, and by the time the effort was made to raise the pole there was a very merry mob of Democrats in line. At last, just before noon, Brown, a sailor, assisted by Taylor, and several others got the first section squarely in the hole. By noon, Brown was knocked out by accessions from the storeroom and a Swede sailor undertook putting up the second section. He managed it pretty well, but when the pole was finally in place, with a 75-degree list off windward, it was discovered that the tackle was jumbled and the flag couldn't be attached. In this dilemma, the dare-devil Brown came back into prominence and actually climbed the leaning pole to where the tackle was tangled and put it to rights. Well, according to the soberest man present (as he says himself) it was about 5 o'clock in the afternoon when the great flag finally mounted up to its dizzy height and all the "holler" that was left in the full but hungry crowd of loyal Jacksonians rose above every other sound like the last sally of victorious football rooters. [David] B. Edwards was there, Charles Donovan and Medill Connell were there, Edward Connelly and P.E. Connelly, John De Fries and T.M. Smith "were among those present" and jovial Billy Leach was on deck as the sole representative of the Reveille [See Dan's friends identified]. The attempts at speechmaking were several, but I have never seem them quoted. Leach made a particularly amusing attempt to glorify the occasion with sonorous phrases but after he got into position on top of the veranda of the hotel, he forgot all but the catch notes, and finally bowed himself into the house through a convenient window. It is said that all the Fairhavenites had to cross a log over Harris Creek on Harris Street between Seventh and Eighth, and Bart Edwards says that many a one refreshed himself by rolling into the drink. The Whatcom men, about eight or nine, went home in a rowboat and stopped at the Bellingham Hotel bar long enough to tell all about it and sing a few mixed lines of song. Altogether it was the most amusing if not the most noteworthy political celebration ever eventuated in the northwest, and provided abundant material for lots of harmless banter and fun in after years. Nobody has been able to explain to me what became of the monster flag. It has probably gone to the paper mills in bundles of rags long ago. 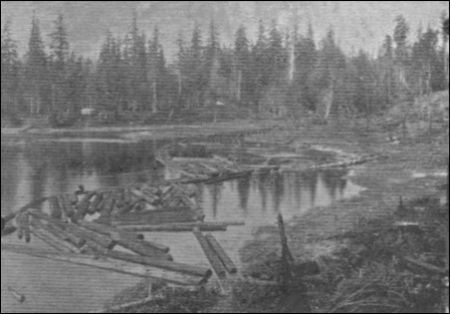 This 1891 Fairhaven Illustrated photo shows a view looking northeast from Dead Man's Point across the mill pond and the mouth of Padden Creek during the early days of Dan Harris's townsite. Mr. Taylor informs me that Dan Harris was not born in Sag Harbor, but in Patchogue, Long Island. He quarreled with his brothers and ran away from home, going to Sag Harbor, New York, where he shipped on a whaler going to the Alaska coast. Honolulu was a favorite outfitting port for the whalers and when gold was discovered in California, many whalers deserted upon returning from the north. Harris and others did not reach Honolulu till 1852, but when they did they deserted and eventually landed in Victoria, B.C. from where Harris came to Bellingham Bay in 1853. 3a Lelah Jackson Edson Almost all of us who research Whatcom history or genealogy soon read Edson's book, The Fourth Corner, which is full of both facts, dates, character profiles and anecdotes. I have been reading it, off and on, for the past 40-some years, but only in the recent past have I compared her accounts with those of Frank Teck and Hugh Eldridge. Some of them are nearly identical and seeing who influenced a writer is always important in determining bona fides and/or possible bias of the source. I am struck, however, by the lack of a profile of Mrs. Edson, herself, which seems odd when you consider her influence. Perhaps someone has written such a biography of her but that has escaped me. Whatcom researcher Donna Sand helped me piece together a capsule. I have assumed, incorrectly that her father-in-law was the much-noted Sehome printer, John M. Edson, but that is incorrect. Sand found these basics: "Lelah Blanche Jackson was born Nov. 7, 1882, in Mabel, Minnesota to Griffith L and Lydia C. (Morgan) Jackson. She died May 6, 1962 [while I was graduating from high school] and is buried at Enterprise Cemetery. She attended the [Whatcom] normal school [now Western Washington University] in the 1899-1900 year but is listed as an alumnus of Bellingham's North Side High School in 1902. In the 1908 [Polk?] directory she is called a teacher at Enterprise and in 1909 she is a milliner at Everett. The 1910 census lists her at Everett as manager of millinery." To determine Ms. Jackson's marriage details, Donna had to research the various Federal censuses for Lynden. In 1883, Edward Edson moved to Whatcom County with his widowed mother, his sister, Ellen, his first wife — Mary Hamburg, who died by 1910, and their son Gale. Edward and Ellen's father, G.M. Edson, was one of the pioneer physicians of Iowa, where he died, and the family moved to Kansas before moving to Whatcom. Edward opened a pharmacy in Lynden in 1891 and was mayor of that city when Lottie Roeder Roth wrote her History of Whatcom County in 1926. Sometime between 1910-30, Lelah Jackson married the widower Edward and he died on 17 Dec 1944. Sand and Susan Nahas, Whatcom Rootsweb coordinator, noted that they may have divorced. We hope a reader can help us fill in the gaps. Edson published her famous book, The Fourth Corner in 1951 and The Whatcom Museum of History and Art published in a second edition in 1968. In the first edition, she recalled: ". . . forty-eight years ago, as a young teacher in the big woods of the Olympic Peninsula, I became definitely committed to the study of unwritten history. This was when the foster father of that tragic character, Jimmy Pickett — artist, half-Indian son of General Pickett, showed me Jimmie's little red leather trunk brought from Russian America by his deceased Indian mother and he told me his story." Lelah Jackson Edson came to Whatcom County as a young girl "when steamers and canoe were the standard methods of transport and roads were almost non existent." She died May 1962 at age seventy-nine. 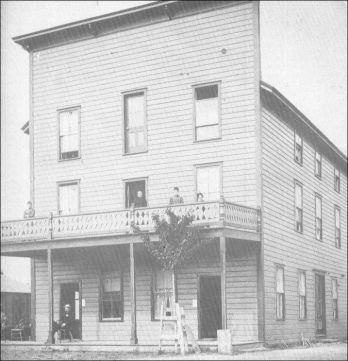 This Biery photograph of Dan Harris's original Fairhaven Hotel was taken sometime before 1890, when the new, grand Fairhaven Hotel rose eight blocks east on Harris Street where Nelson Bennett and the Fairhaven Land Co. established their downtown. Sometime after 1890, the new owners renamed this structure at the northwest corner of 4th and Harris streets the Northern Hotel. The hotel was replaced in the early years of the 20th century by a building of the Pacific American Fisheries complex and the site is now home to the Amtrak Depot. 8. Fairhaven/Northern Hotel and Dan's flagpole All the authors of Whatcom History books so far have interchanged the names, Fairhaven Hotel and Northern Hotel, which is frustrating, so we will briefly explain. In 1983, the year when Dan Harris first platted his townsite as "Fair Haven on Harris Bay" on January 2, he had constructed a three-story, woodframe hotel at the northwest corner of 4th and Harris streets. Today that is near the Amtrak Depot. Although the hotel didn't officially open until the next spring, it opened informally to guests and residents by the fall of 1983. 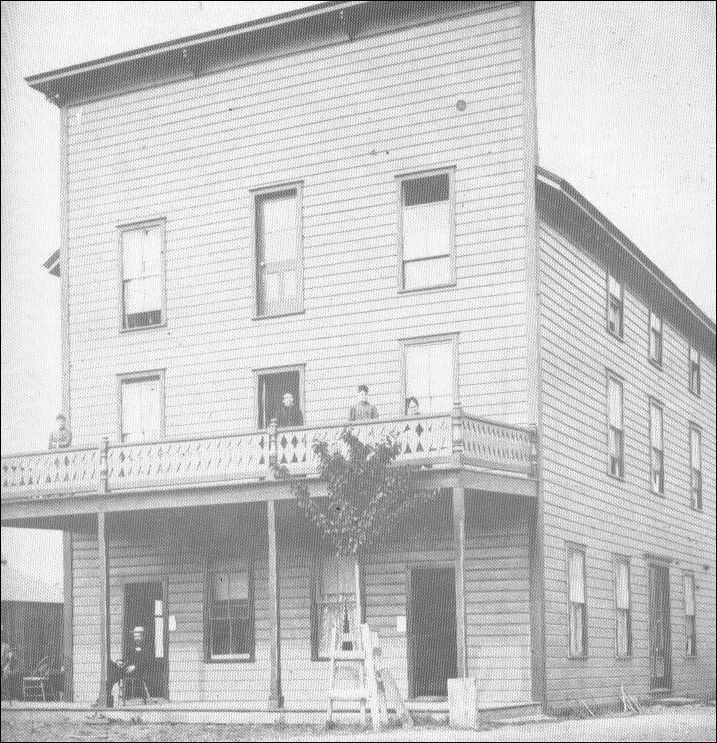 On June 29, 1883, the Whatcom Reveille announced that "Mr. Harris, of Fairhaven, has painted his hotel, which improves its appearance very materially." In the first decade it did not have a sign on the front as it did later. Maybe in the early days it was the only real hotel in town and located near the dock, so the Fairhaven name was just assumed. On June 4, 1884, the Reveille announced the grand opening. "The ball and supper given at the Fairhaven Hotel, last Tuesday evening at the opening of the house by Mr. and Mrs. Charles Miller were enjoyable and successful. Dan Harris has furnished the hotel through in elegant style — lace curtains, walnut furniture, piano, carpets and other appointments in keeping. The opening of this fine hotel at Fairhaven will give the beautiful cove in which it is located a more business-like appearance." As Teck explained, Democratic Harris installed the flagpole and the nation's largest flag on March 4, 1885, to celebrate Grover Cleveland's inauguration for his first term. The hotel was profitable at first, benefiting from the influx of new settlers that reached a fever pitch by March 1882 and continued for a year or so as the Kansas colony arrived. Upon the hotel's opening, Dan outfitted himself in a bit more sartorial splendor than before as he strolled daily out onto the dock in a new high silk hat, a Prince Albert coat and trousers of broadcloth, to act as greeter for visitors to his new town. On Oct. 16, 1885, the Rev. B.K. McElmon of the St. James Presbyterian Church married Dan and Miss Bertha L. Wasmer, who had recently arrived from Wisconsin. As the boom approached in 1888 after a few years of a stagnant economy, the hotel did good business again. When capitalist Roland Gamwell arrived by steamer from Tacoma on Aug. 15, 1889, he lived at the hotel for two months. And when Charles X. Larrabee arrived in town for the first time to divvy up Fairhaven with Nelson Bennett, he also stayed at Dan's hotel briefly and did again when he returned in early 1890, while he bought the new Fairhaven Hotel from Bennett as it was being completed. After the new grand hotel opened at the northeast corner of 12th and Harris on Sept. 15, 1890, Dan's hotel briefly became the Great Northern in the Day Directory and then the Old Fairhaven in the 1891-92 Gazetteer Directory. During the nationwide Depression of 1893-97, the hotel became a derelict, a home for weekly and monthly renters instead of the overnight guests of old, and then became a boarding house for Chinese workers at the Pacific American Fisheries (PAF) next door. By 1898, it was known as the Northern Hotel, with the name painted in huge letters on the front of the third story. On April 11, 1903, the Evening Herald reported that the flagpole still stood mounted on the old stump on the corner, but the old flag "probable gone to the paper mills in bundles of rags long ago." Then, on Aug. 10, 1904, the Bellingham Herald reported that the pole had been lowered and then reinstalled at the home of Edward M. Wilson at 15th and Knox in Fairhaven, with the ultimate ignominy. Republican Wilson re-christened as the Republican "Theodore Roosevelt" pole. 10. Dan's pals In the 1885 census, David B. Edwards was listed as age 30, hotel keeper. The hotel was the Bellingham Hotel, which you should not confuse with the later Bellingham Hotel that was erected by John Stenger at B Street and West Holly in Whatcom in 1890 and later became the Ritz. Edwards ran the Bellingham Hotel in the old town of Bellingham, which was platted by Erastus Bartlett and Edward Eldridge in 1883 on the northwest flank of Sehome Hill. Medill Connell bought Charles Donovan's interest in the short-lived Whatcom County Democrat newspaper, which Donovan launched on Sept. 7, 1887, and then sold half interest to J.M. Edson. Introduction Portal to Daniel J. Harris series, including a consensus timeline. Portal to all Whatcom County photo features, resources and links.